IAAF Diamond League Shanghai 2017 will be held at Shanghai Stadium on May.13, 2017. IAAF Diamond League Shanghai was known as the Shanghai Golden Grand Prix when it launched as the first world-class track and field event in China in 2005. IAAF Diamond League is a top annual series of track and field meets which has been held globally since 2010. There are 14 individual meets holding in different cities throughout Asia, North America and Europe. In 2010 the Shanghai Golden Grand Prix has been invited to join the prestigious IAAF Diamond League and became one of the only two stops in Asia. 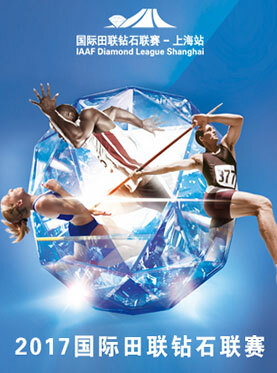 IAAF Diamond League Shanghai is annually held in May at Shanghai Stadium with more than 100 world-class athletes including Olympic champions, world champions and world record holders, competing in 16 disciplines in Shanghai each year. The IAAF Diamond League Shanghai invites emerging Chinese athletes of each discipline for the opportunity to join the track and field feast and compete with the world’s best athletes. As the premier global track and field series, the top three athletes of each meet will be awarded double score with the exception of the event finale, directly influencing their year-end world ranking. Delivery is not available within 3 days before the performance. We highly suggest customers come to our office to buy tickets then. Children under 1.2m in height are NOT admitted except for children program, beyond 1.2m are admitted with tickets!